OK, so if you follow this blog regularly you will have seen all these pillboxes before, but the area is simply one of the best walks for pillboxes and they always look slightly different according to the light, the season etc. These photos were taken in the mid afternoon September sunshine on my recent visit up north. All pillboxes are of the Northern Command Lozenge type (except for one photo of the rear of an 'Eared' Pillbox). The last time I saw this pillbox, on a caravan park to the south of Barmston, it was half buried under earth! Above: The pillbox landscape to the south of Barmston. Above: The pillbox landscape just to the north of Barmston. Note the sweeping field of fire the twin Vickers (Eared Pillbox) had - rear of pillbox shown in middle image. These last two images of a Lozenge Pillbox were actually taken on Flamborough Head, been wanting to visit this one for years but the field has always been under crop on previous visits. 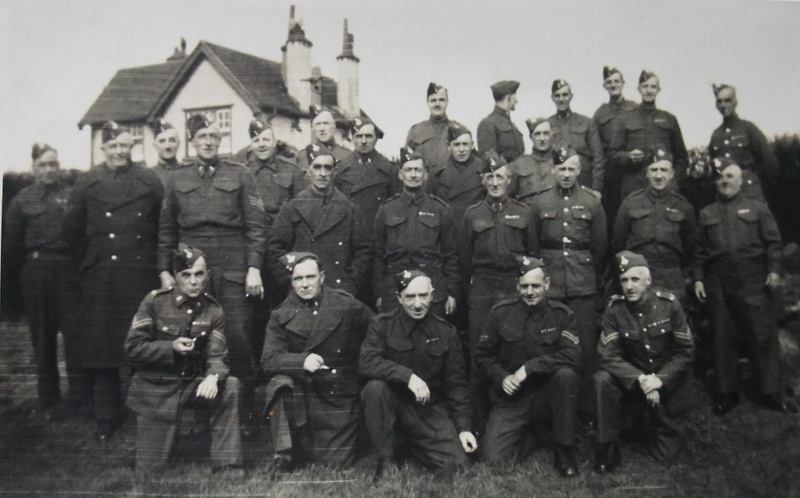 To end this blog, a photo of a postcard that I picked up of some of the Home Guard (Yorks Regt) - if anyone can recognise the location I would love to know! 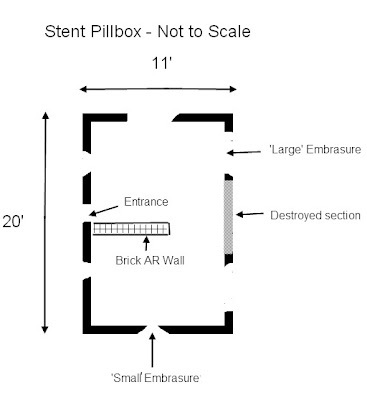 The Stent Pillbox is basically a prefabricated pillbox constructed of 'hollow concrete sections bolted together and filled with rubble and/or poured concrete' (M Osborne- Pillboxes of Britain and Ireland). Typically these pillboxes resembled the Type 26 square pillbox although some were apparently a 'double version', of which the Filey example is almost certainly one. It's dimensions are approx 20' x 11' with a central brick dividing / Anti-ricochet wall. 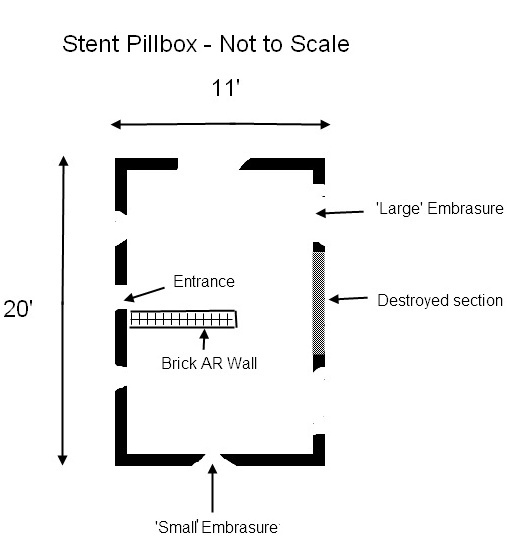 The pillbox has at least six embrasures (possibly more but a section of wall is destroyed). Three of the embrasures would appear to be typical pre-cast embrasures for a rifle or light machine gun with a weapons shelf but three are much wider and have a recess low down in the inner wall - I have no idea what weapon these were for. The pillbox would seem to be filled with rubble / poor quality concrete. Chalk can clearly be seen to have been used to infill parts. Personally, if I had been facing the enemy I would rather have taken my chances in the open than in this pillbox - I cannot see how it would have even been bullet proof. On an interesting note, I had forward to me a note in a war diary about the erection of an 'experimental' Stent in the Yarmouth area - the first I've heard of this type of pillbox in Norfolk/Suffolk - certainly a lead to follow up on. Above: Interior of pillbox - note the two types of embrasure (and the lower recess in the large type of embrasure). Last image shows the entrance and interior brick wall which would have given some strength to the pillbox and also acted in part as an Anti-ricochet wall. Above: The exterior of the pillbox. Note the standard pre-cast small embrasure (last two images) and the large type of embrasure (top image - albeit damaged). Note also in the second image the chalk rubble used to infill the pillbox. I must admit to have done no research into Yorkshire so cannot offer any more details on this pillbox than above. If anyone knows the intended role of this pillbox or the weapon the larger type of embrasure was designed for please leave a comment!! Continuing with my journey up north, I took some time to look at some of the pillboxes in the Nordelph area. This area seems to have been particularly heavily defended - Mike Osborne in his book '20th Century Defences in Britain - Norfolk' lists 12 shell proof Type 24's and four Type 28's still surviving between Denver Slice and Three Holes (along the Pophams Eau spur) amongst other surviving defence structures. I only had time to look at a few of these. 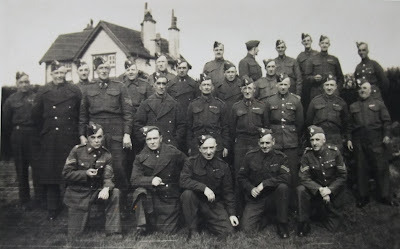 The following pictures show some of the Type 24's and a Home Guard store in Nordelph. Final post in this thread will look at some of the pillboxes along Pophams Eau. Work continuing in the background on the website - never being content to finish off one subject once started, the first in a series of pages on Suffolk's part in OVERLORD soon to be posted!! Visiting family in Yorkshire again, I took the opportunity to stop off at a few pillboxes on the way. These are some of the pillboxes on the northern extension of the Eastern Command Line, which leaves G.H.Q Line East at Littleport to run up the Great Ouse towards Downham Market where it then runs west along Pophams Eau. I only had time to visit a fraction of the defences remaining in this area, so further visits required in the future (although as most are in Norfolk must admit not high on the agenda!). The first pillbox I cam across was a bullet proof Type 24 along the A1123 which was presumably part of the outlying Cambridge defences / GHQ Line as it ran north of Cambridge along the River Cam. Next up was a Type 28a pillbox for the 2 pounder anti-tank gun on the northern extension of the Eastern Command Line. It is located at Brandon Creek, just to the south of Southery. Note the screw pickets on the roof and the remains of a black finish on the roof to hide the shine form the concrete. I have no idea what the metal rods protruding from the inside of the embrasure where for. Just a little further north up the road was this Shell proof Type 24. Part 2 of this thread will look at some of the pillboxes on the northern extension of the Command Line in the Nordelph area.